Birkirkara and Tarxien Rainbows shared the spoils in a highly entertaining 3-3 draw at the Hibernians Stadium. A result thanks to which the Stripes regain sole leadership but they are now just one point ahead of the Citizens, just one week before the two teams cross swords in a top-of-the-table clash. Tarxien showed great determination, taking the lead early in the game and although Birkirkara were quick to equalise, the Rainbows regained the lead, going two goals ahead. However the Stripes made a good comeback to score twice and earn a point from the game. Both sides were unable to field their best formation due to the absence of Birkirkara’s Trevor Cilia and Rowen Muscat and Tarxien’s Justin Grioli and Kurt Magro. Birkirkara went close to taking the lead after just one minute when a diagonal shot by Karl Pulo from the left scraped past the post. One minute later, a first-timer by Paul Fenech hit the crossbar. Sylvano Comvalius then tried his luck with a powerful drive ending just wide on 15 minutes. The Rainbows managed to take the lead on 17 minutes when Anderson Mendes Ribeiro released Denni Rocha Dos Santos on the right and the latter served the unmarked Gianluca Calabretta who hit low from close range. Birkirkara levelled matters two minutes later when off a perfect cross by Carlo Mamo from the left, Shaun Bajada headed home. On 26 minutes, Jorge Mora rushed out of the area to anticipate Denni before he could conclude. 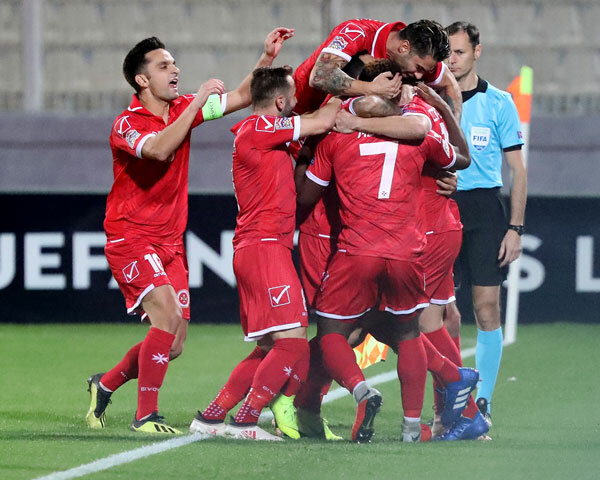 However one minute later, Tarxien were not to be denied as the Brazilian midfielder concluded a fine solo effort with a perfect pass for Gianluca Calabretta who managed to beat the Spanish goalkeeper with a shot from the left. Seven minutes from the end of the first half, Tarxien missed an incredible chance when Riberio sent Denni through and the latter, all alone, tried his luck with a dipper but missed the target. Six minutes in the second half, Karl Pulo headed just wide off a George Mallia freekick from the left. However on 52 minutes, the Rainbows increased the lead when off a freekick from the left, Anderson Mendes Ribeiro headed home past goalkeeper Jorge Mora. Tarxien kept pushing for more and a rising shot by Denni three minutes later was tipped into a corner by the Birkirkara goalkeeper. Birkirkara reduced the gap on 58 minutes with a great goal by Shaun Bajada – a direct freekick from the right which gave goalkeeper Anthony Curmi no chance. On 64 minutes, Karl Pulo served Michael Galea from the left and the latter’s close-range effort was blocked by Anthony Curmi. Off the rebound, Paul Fenech’s shot from outside the area was turned into a corner by the Tarxien goalkeeper. Three minutes later, Curmi performed another fine save on a Karl Pulo header from close range. On the other side of the pitch, a low shot by Anderson Ribeiro from the right was blocked into a corner by Mora on 73 minutes. Anthony Curmi was superb once again with a brilliant save on a Karl Pulo header, served from the right by Sylvano Comvalius. Birkirkara equalised on the 85th minute when off a Shaun Bajada freekick from the right, substitute Alan Tabone intelligently flicked the ball for Michael Galea to head the ball home from close range. Three minutes in added time, Sylvano Comvalius went close to notching the winner for the Stripes after hitting the crossbar when served by Michael Galea from the left. Anthony Curmi was voted BOV Player of the Match. TARXIEN Anthony Curmi, Manuel Caruana, Gianluca Calabretta (76’ Ryan Grech), Everton Antonio Pereira, Anderson Mendes Ribeiro, Mark Tanti (83’ Steve Sadowski), Andrew Decesare, Luke Vella Critien, Denni Rocha Dos Santos, Ryan Mintoff, Lee Galea (59’ David Camilleri). Subs not used: David Cassar, Warren Zerafa, James Shead, Mario Bajada. B’KARA Jorge Mora, Paul Fenech, Karl Pulo (84’ Alan Tabone), Nikola Vukanac, Branko Nisevic, Carlo Mamo, George Mallia (61’ Thomas Paris), Shaun Bajada, Angus Buhagiar (90’ Joseph Zerafa), Michael Galea, Sylvano Comvalius. Subs not used: Omar Borg, Andrew Scicluna, Ryan Scicluna, Diansand Brincat. Meanwhile in the first match, Floriana moved another important step towards securing their Premier League status as they scored three in the second half to beat Dingli Swallows 3-0. The Greens now lie nine points ahead of Msida St. Joseph, although the latter have a game in hand. After a quiet start for the two teams, the Greens had the first attempt at goal on 11 minutes with a Ryan Darmanin header off a cross from the right. Three minutes later, a diagonal shot by the same player ended just wide. 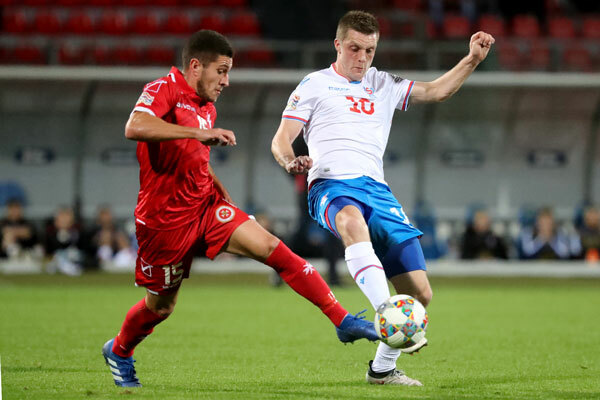 Four minutes in the second half, Floriana took the lead when off a cross by Stefan Lijeksic from the left, Ryan Darmanin controlled before beating Ivan Cassar with an overhead kick. Four minutes later, Michael Ghebru doubled the score when he finished off a good run on the right flank with a powerful shot which beat the Dingli goalkeeper. Ghebru went close to increasing the lead on 57 minutes after exchanging the ball with Christian Caruana but his attempt was blocked into a corner by Conceicao. Dingli replied with an Andre Rocha Da Silva freekick from the left ending wide on 76 minutes. Three minutes later, Ryan Darmanin, served by Joseph Borg from the right, hit just wide with a first-timer. Floriana sealed the issue with another goal eight minutes from time thanks to substitute Clifton Ciantar whose fine shot beat Ivan Cassar. Ryan Darmanin was voted BOV Player of the Match. DINGLI Ivan Cassar, Roderick Briffa, Renato Conceicao, Shawn Tellus, Roderick Spiteri, Kurt Formosa (70’ Dylan Zarb), Victor Fiteni (80’ Clint Caruana), Christian Muscat (61’ Haruna Doda), Kevin Borg, Andre Rocha Da Silva, Joseph Okonkwo. Subs not used: Jeffrey Farrugia, Charlon Sammut, Matthew Borg, Christopher Azzopardi. FLORIANA Bernard Paris, Orosco Anonam, Sacha Borg, Owen Bugeja, Pablo Doffo, Michael Ghebru (72’ Clifton Ciantar), Joseph Borg (86’ Mark Spiteri), Ryan Darmanin, Stefan Lijeksic, Christian Caruana (81’ Clyde Borg), Stefano Grima. Subs not used: Jurgen Micallef, Julian Briffa, Roberto Brincat, Jermain Brincat.